Les Miserables by Victor Hugo. I read it at thirteen, after seeing the musical in London, and it sparked a love of the classics that saw me reading nothing but eighteenth and nineteenth century literature for a good three years. When he asked her to be his wife, clumsily, and with agonizing effort, she was uncharacteristically silent. Chava was clever and could not stave her appetite for reading, for any kernel of information she could collect from a world beyond their own. In After Anatevka, Alexandra Silber picks up where Fiddler left off. Second-eldest daughter Hodel takes center stage as she attempts to join her Socialist-leaning fiancé Perchik to the outer reaches of a Siberian work camp. 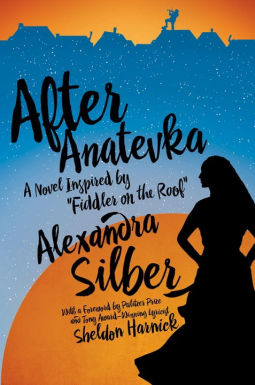 But before Hodel and Perchik can finally be together, they both face extraordinary hurdles and adversaries—both personal and political—attempting to keep them apart at all costs. A love story set against a backdrop of some of the greatest violence in European history, After Anatevaka is a stunning conclusion to a tale that has gripped audiences around the globe for decades. I have only read the first half of Les Miserables and had to set it aside because my undergraduate studies required my full attention at the time. I have yet to go back to it, years later. I do want to try again though as i was enjoying it quite a bit. I love the musical. It's one of my favorites. I think many of us can relate to Chava in your Friday56 teaser. After Anatevka sounds really good. I will have to keep an eye out for it. Thanks for stopping by. Hope you get to finish Les Miserables one day. It's worth the effort! Very interesting that LES MISERABLES changed your life. I like it. GREAT choice of book for your BBH answer, Nicki! I can't believe I've owned "Les Miserables" for several years now, and STILL haven't read it... Is it too late for a New Year's resolution? How about a summer resolution? Lol. "Fiddler On The Roof" is one of my favorite musicals ever!! I had not heard of this book that takes up where the original story left off, so thanks for putting it on my radar! I DEFINITELY want to read it!! Hopefully you'll get to Les Miserables one day! After Anatevka is mostly about Hodel and Perchik. It may be a little grim for your tastes (based on comments you've made in past book blogger hop questions) but I enjoyed it. Thanks Lauren. See you next week. For me it would be Outlander. I got me back into reading after 4 years of studying English Lit in college. Ohh wow great answer on the blog hop question, I don't think I have the guts too read a book like Les Miserables. Because the book is huge and I don't really like reading huge books, I think I rather watch the movies instead. lol Thank you so much for stopping by my blog hop and have a great Sunday Nicki. Well, if you decide to try a filmed version of Les Miserables, I recommend the four-part French one with John Malkovich and Gerard Depardieu. It's available with English subtitles and is the best film/TV version I've seen. Avoid the Liam Neeson film version; it's appalling. Happy Hopping! Sounds like a good read! :-) Have a great week ahead!